Tripp Lites U360-004-R USB 3.0 SuperSpeed 4-port hub carries your data from a USB3.0 enabled computer at a blazing 5Gbps transfer rate. Connect to a variety of USB enabled devices such as USB external hard drives, cameras, printers and more. Backward compatible to previous USB generations. Bus powered for use with devices that require minimal power. For more power hungry devices, an external power supply is included. Sleek, compact design is perfect for USB port expansion. This Tripp Lite USB 3.0 SuperSpeed Hub assures that you get maximum performance from multiple USB 3.0 devices connected to a single computer. 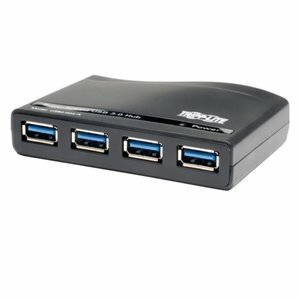 The U360-004-R enables you to connect up to four USB 3.0 devices through a single USB 3.0 port on a computer. This hub is simple to use, with no special software or complicated set-up procedures required. Just plug it in and you're ready to play! Hot-swappable functionality allows you to add or remove a device at any time with no need to power down the computer. The U360-004-R is manufactured to exacting specifications, using superior materials, to deliver full USB 3.0 performance for multimedia and other high-end applications. And we back our pledge of quality with a 3-year warranty. With its superior design and construction, the U360-004-R is ideal for a wide range of USB devices, including flash drives, external hard drives (with external power adapters), external DVD players, MP3 players, digital cameras and other high-end applications that require fast, clear transmission, free of line noise and other interference, over long distances. It supports faster data transfer rates (5 Gbps) for new, high-speed devices and is backwards compatible with USB 2.0, which means you can keep using older peripherals. USB 3.0 SuperSpeed uses 1/3 of the power of USB 2.0 to transfer the same amount of data. Conversely, during charging applications, the U360-004-R delivers twice the power of USB 2.0 for faster device charging. The U360-004-R has lower active and idle power requirements, and does not require device polling. Harness all of the strength of USB 3.0 technology without sacrificing compatibility. USB 3.0 is backwards compatible with USB 2.0, making it an ideal and versatile solution for any USB application, as well as allowing for growth. The U360-004-R is designed to integrate easily with both desktop computer setups and portable notebook computers. On the desktop, an included 6-ft. USB extension cable enables the hub to be conveniently positioned. On the go, the U360-004-R is small and light enough to fit in a briefcase or notebook case—giving you the convenience of multiple USB ports no matter where life takes you! The U360-004-R features per-port over-current protection (500mA max. as per the USB specified) to safeguard your connected peripheral devices against damage or data loss due to overvoltages. The U360-004-R provides plug-and-play convenience, with no special software or complicated setup procedures required. The U360-004-R also features hot-swappable functionality, allowing you to add or remove a device at any time with no need to power down the computer. The U360-004-R is bus-powered via the computer's USB port, and for most applications no external power is required. The included power adapter is provided to enable connection of power-hungry devices. The U360-004-R is compatible with Windows 98, Windows 98 SE, Windows 2000, Windows ME, Windows XP, Windows Vista, Windows 7 and Mac OS 8.6 or higher. It connects desktop and notebook computers equipped with a USB 3.0 A (female) port to USB peripheral devices equipped with a USB 3.0 A (male) connector. The U360-004-R is compatible with both USB 3.0 and USB 2.0 applications. When you choose the U360-004-R, you get quality performance plus peace of mind! The U360-004-R comes with a 3-year warranty.